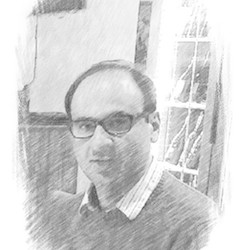 My research focuses on the development of modern statistical methodology for inferential and predictive applications. This includes methodological research in combining computationally expensive simulation models with observational data and research in non-parametric Bayesian regression tree models for "big data'.' My work is generally developed within the Bayesian paradigm and is often motivated by environmental, environmental health, climate or engineering applications. Matthew Pratola joined the statistics faculty in 2013. He is currently an Associate Editor of Technometrics and has served the profession through various roles in the Section on Physical and Engineering Sciences (SPES) of the American Statistical Association (ASA). His work on Parallel Bayesian Additive Regression Trees was named a noteworthy article by the Journal of Computational and Graphical Statistics and included in the ASA's article collection on Bayesian Statistics and his work on Fast Sequential Computer Model Calibration of Large Non-Stationary Spatial-Temporal Processes was awarded the 2014 Wilcoxon Prize. On a more personal note, Dr. Pratola's interests include cycling, yoga, music, reading and food.